Wrapping you in cozy comfort, this versatile big button shawl has all the style of your favorite cardigan—minus the cumbersome sleeves. One large, stylish button lends a subtle fashion accent while allowing you to easily secure the dress shawl and change the look. Button it in front for classic ease, on the shoulder for a dressier alternative, or drape and button it loosely on your arms for a stylish capelet. Great for year-round layering and summer air conditioning, our soft, sweater-knit women's shawl is perfect for travel and easy to pack. Specify color: black, blue, brown or red. Features one button (2 1/2" dia.). One size fits most; 17" wide x 62" long. 100% acrylic; machine wash. Imported. So easy to throw on when I need a bit more warmth indoors! I've purchased this for my stepmother for Christmas and I was very relieved when it arrived, looking just like the picture. I put it on and styled it the two different ways shown in the picture and it fits well and looks great. She will really like it. The only concern I have is whether it will snag since it's a solid color. Different from any shawl i have had before. Very pleased cash wear several different ways. More for looks th,an warmth. Recommend. Wintertime is a challenge to me who is a cold sufferer. When I use the bathroom, I am forced to remove my long heavy coat. Usually I end up uncomfortably cold. 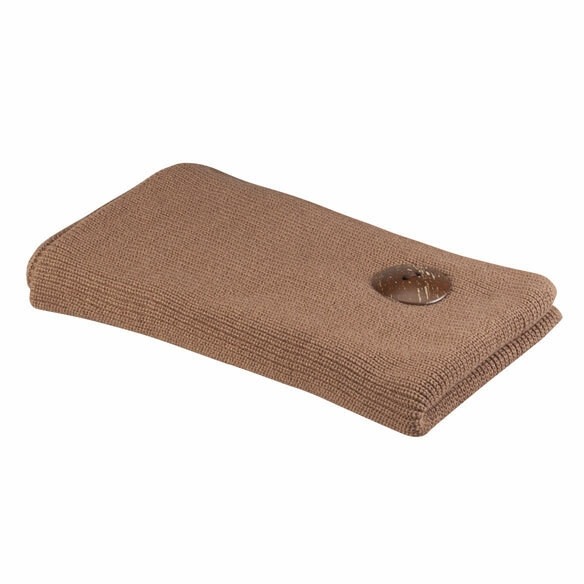 This shawl replaces my heavy coat and it keeps my upper back, shoulder and arms dry and warm. Its very practical. Will be buying in additional colors! recovering from surgery. Comfortable when sitting in my chair or in bed. I like shawls and I don't have one of this color. Will keep me warmer on cold days. Perfect for grabbing to take to different areas of my retirement community, where temperatures and drafts vary significantly. I’m always cold. It’s hard to get yours arms out of your sleeves or it’s too tight of a fit a sweater over your clothes or you get too hot in the arm pits with a regular sweater. Looks good & not expensive. Do I get rebate & free shipping? Chose this for my 98 year old Mom who always wears a shawl for warmth which always seems to fall off her shoulders and ends up on the floor. I think this will be the perfect solution to keep her warm and stay in place. Am looking forward to receiving it. It looks nice. I just hope it will be warm. Needed new shawls for holiday. These looked really nice and length is good for me. I like the big button style. I am cold in the winter and I think that I can wear this around the house and it will keep me warmer and leave my arms free to do chores. Loved the deep clear blue of this shawl. The one large button will be easy to handle and I often need a wrap like this. Over the shoulder easily , better to wear with my arthritics hands. how do i select a valid style in the one button shawl? BEST ANSWER: I think I understand the question. 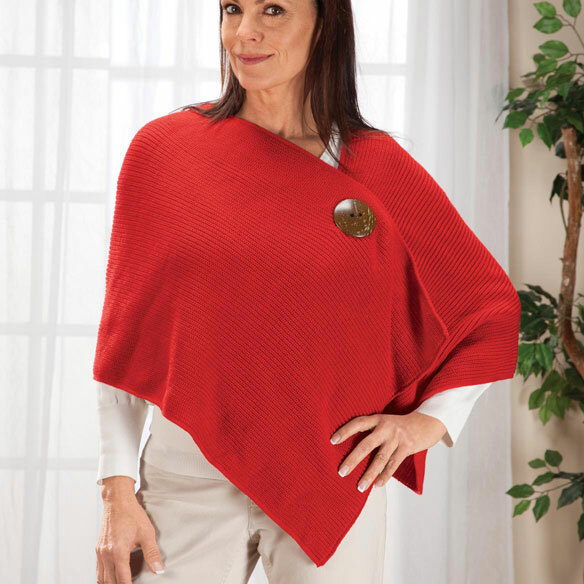 This shawl is an oversized rectangle you can wear it any way you want. The only choice to make is what color you want. I have been enjoying mine many different ways. Everyone's body style is unique so each person will wear it differently. The pictures the easy comfort show you is just suggestions not something you need to choose. Style is a misnomer, you're really selecting a color. does the shawl have sleeves? if its windy will the shawl blow off ? BEST ANSWER: The shawl is one long knitted piece that wraps around your shoulders and fastens with the large button in the front. It does not have sleeves. Since it buttons securely, I don't believe it would be impacted by the wind but I cannot say 100% as I bought it for my 98 year old mom who rarely goes outside. However, it is stylish and can be worn by a woman of any age. No sleeves. I only wear it in the house but it’s heavy so probably would stand up in wind. No sleeves, but using the button would keep it from coming off.